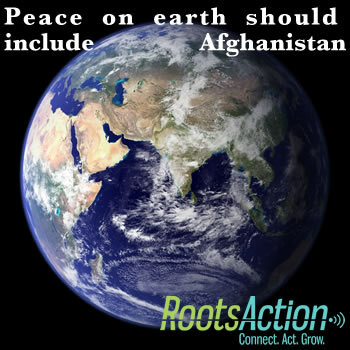 Let there be peace on earth, and let it include Afghanistan. We cannot be for peace without being against war. We cannot be satisfied with inner peace while wars are being waged with our money and in our names. The largest of those wars remains Afghanistan. It is larger now than when Barack Obama first became president. There is no strategic, legal, or -- above all -- moral justification for continuing this war for another year, or for another day. Please take a moment to tell our government that we want peace on earth.